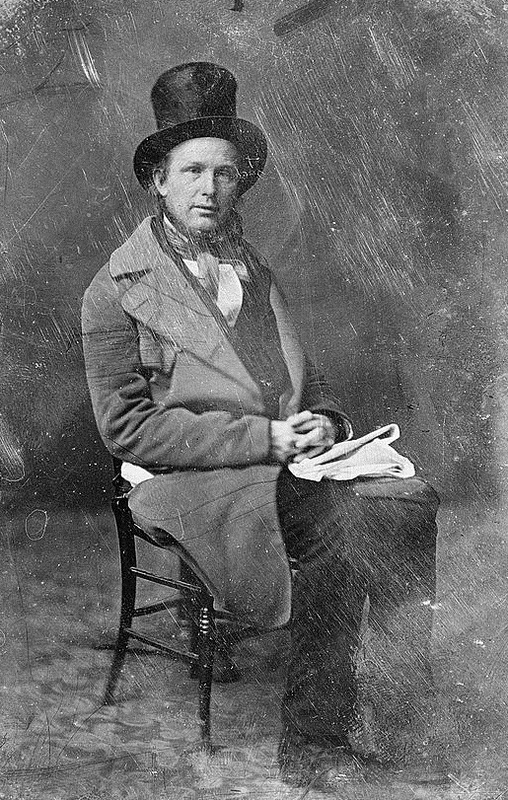 Horace Greeley, radical Republican and editor of the New York Tribune (Library of Congress). Though a conservative Catholic Democrat before 1861, General William S. Rosecrans courted the support of radical Republicans during the American Civil War. His friendship with fellow Ohioans such as Secretary of the Treasury Salmon P. Chase, Senator Benjamin Wade, and Congressman James A. Garfield was forged by their mutual desire to save the Union and destroy slavery. Rosecrans’s victory at Stones River in January 1863, his public denunciations of Copperheads (anti-war Democrats), and his support for emancipation (published in an April 1863 issue of The Catholic Telegraph of Cincinnati, Ohio) endeared him to other radicals as well, including the leading anti-slavery Republican editor in the nation, New York’s Horace Greeley. Despite his frequent criticism of the Irish, Catholicism, and New York’s Archbishop John Hughes before and during the war, Greeley seriously explored the idea of running the Catholic Rosecrans on the Republican ticket for president in 1864. Rosecrans’s star, however, fell precipitously after his defeat at the Battle of Chickamauga on September 20, 1863. A chorus of northern newspapers, including Republican editors who had praised him after Stones River, harshly criticized his generalship after his removal from command in late October. By contrast, Greeley’s comments on Rosecrans’s removal seemed relatively restrained: he simply urged his fellow northerners to trust that the federal government had made the right decision. Nonetheless, Rosecrans bitterly resented Greeley’s later attacks as unfair to him and to the truth of what had actually happened at Chickamauga. It was not until shortly after the war, however, when Rosecrans had the chance to reply directly to Greeley. Greeley had written a letter to the general, sometime in late 1865 or early 1866, asking for a copy of the Annals of the Army of the Cumberland. Rosecrans not only sent the Annals but appended a long letter dated January 8, 1866, explaining his decisions before, during, and after Chickamauga. While his latter writings on the battle are better known to historians, this letter was certainly his earliest post-war defense of his conduct. Greeley never printed it, so Rosecrans seems to have paid for it to be transcribed and published as a pamphlet. It is unclear how widely it was circulated or if it had any impact on how his contemporaries viewed the battle. The letter was not frequently cited in post-war histories, and is often overlooked even today by modern scholars of Rosecrans’s battles. Only a few copies remain, one of which was generously digitized for me by the librarians at Trinity College in Hartford, Connecticut. I have transcribed the entire fifteen-page letter in the hopes that it will be useful in understanding the Battle of Chickamauga from Rosecrans’s point-of-view. I have faithfully retained Rosecrans’s original punctuation and spelling. While he does vastly exaggerate the number of Confederates he faced, it nonetheless is a valuable explanation of his actions and decisions as the Army of the Cumberland’s commander. The letter provides useful insight into his conduct at the battle, especially regarding his decision to retire to Rossville and then Chattanooga while the Union left under George H. Thomas was still fighting. The full transcription is below, with a pdf attached for download here. William M. Lamers, The Edge of Glory: A Biography of William S. Rosecrans, U.S.A. (New York: Harcourt, Brace & World, Inc., 1961; reprint: Baton Rouge, Louisiana State University Press, 1999), 258-260. New York Times, October 22, 1863; New York Herald, October 22, 1863; New York Tribune, October 21, 1863; William Rosecrans to Robert Colby, December 29, 1869, William S. Rosecrans Papers, UCLA Special Collections Library, Los Angeles, California. Greeley’s letter is mentioned by Rosecrans in a letter to his wife (William Rosecrans to Ann Rosecrans, January 11, 1866, Rosecrans Papers, UCLA). Although the original manuscript copy may no longer exist, copies of Rosecrans’s printed reply are also available at UCLA, the Huntington Library, and the Library of Congress. New York, Jan. 8th, 1866. DEAR SIR:—With this, as requested, I send you a copy of the 6th edition of the “Annals of the Army of the Cumberland,” containing my official report of the campaign and battle of Chicamauga, which gave us East Tennessee and the gateway to the heart of the Southern Confederacy, written, it will be proper to say, not under my direction nor at my instigation. It is the testimonial of a just and patriotic citizen of Alton, Ill., to the gallant deeds of an army which has done as much for the country as any equal number of all the heroic men who have fought in this great war for Freedom and Civilization. The Army of the Cumberland could not have made that campaign, with reasonable chances of success, until the railroad was in condition to transport supplies to the Tennessee river. Nor could it have done so until corn was ripe enough for forage, since it could not have transported the necessary supplies of ammunition and subsistence had forage been superadded. Therefore it could not have moved materially earlier than it did. It was represented to the General-in-Chief, to Mr. Stanton, and to the President, and was, moreover, the simplest dictate of military prudence, that this movement should be strongly supported. Because it was to deal the enemy a mortal blow it must needs expose our army by reason of its great distance (153 miles) from its base of supplies, with formidable intervening obstacles—mountain ranges and the broad Tennessee;—and because the objective was a point on which the enemy could concentrate by rail from all parts of the Confederacy east of the Mississippi, behind the most formidable barriers, in a country to them well known, and there securely organize measures of attack or defence. Thirdly, A vigorous demonstration on Lee, to prevent him from reinforcing Bragg. General Burnside’s command was not sent to reinforce the Army of the Cumberland, and only co-operated at a great distance, by taking possession of East Tennessee,—the evacuation of which by the rebels, was necessitated—by the movement of the Army of the Cumberland across the Tennessee. Nor was any important demonstration made on the Potomac to prevent Lee from reinforcing Bragg, to whom he sent Longstreet’s corps. This failure properly to support the Army of the Cumberland in its movement on Chattanooga, when there were for it, both the amplest means and the highest motives, was contrary to the previous practice of the War Department, which, very properly, supported General Grant’s movements on Vicksburg,—where, if I mistake not, our forces outnumbered the enemy three to one, and our base of supplies was at hand on boats under the guns of a co-operating naval force. This failure to give it proper support, put the Army of the Cumberland and the interests of the country in great and needless peril, exposing it to fight a force greatly superior and concentrated expressly to crush it, or to fail in securing Chattanooga, the objective point of the campaign. The Army of the Cumberland could only have succeeded in crossing the Tennessee and getting possession of Chattanooga by stratagem and manœuvring such as was used. Consequently, by this and by the enemy’s offensive movement, that army was obliged to fight the battle of Chicamauga. Chattanooga, of all arms, say…. 32,000 men. (c) Bragg’s official report of his losses in that battle gives over 18,000 “hors du combat,” and allowing his losses to have been twenty per cent. of his entire army, which is very large, we have, as before, 90,000 men. Besides the foregoing, there is a variety of confirmatory evidence of the substantial correctness of this general estimate of the enemy’s superiority: in the official reports of my subordinates in that battle, who testify to his overwhelming numbers; in the unsurpassed interest and facilities the enemy had for concentration to crush us in that campaign; in the general reports and belief among rebel citizens of the country; in the hopes of the rebel refugees from Tennessee and Kentucky, living at Marietta and other points along the line of the Georgia railroad, many of whom hired conveyances and loaded up their luggage, expecting to follow home Bragg’s victorious army, which they knew to have been overwhelmingly reinforced; and in the strength of this rebel army, which remained to oppose Sherman in his Atlanta campaign, after all its losses at “Chicamauga,” and “Mission Ridge,” and by the return to Lee of Longstreet’s corps, etc., etc. In giving these grounds of verification for the accuracy of the estimate, no account has been made of the Georgia militia, under Governor Brown, which was undoubtedly active as guards of the bridges and depots to the rear, thus enabling Bragg to use every available veteran in the battle, and giving him good grounds for saying, as he did in his General Order of the 16th of September assuming the offensive, that they had been amply reinforced. By that battle the Army of the Cumberland secured its own concentration, full possession of Chattanooga, and defeated a powerful and well-combined offensive movement by which the rebels intended, and from their superior numbers had good reason to hope, to destroy our army and make a triumphant return into Tennessee and Kentucky. Thus, in a campaign of thirty-four days, the Army of the Cumberland crossed three mountain ranges and a broad river and single-handed against overwhelming numbers, fought a great battle which gave it possession of Chattanooga, the long-coveted “key of the Southern Confederacy,” and struck that “institution” a blow from which it never recovered. In that battle,—which Mr. Stanton, for reasons to be judged by impartial history, in his last Annual Report, has presumed to call the “disastrous battle of Chicamauga,”—the Army of the Cumberland lost in its own estimation, none of the prestige of a victory, nor any of its confidence in or affection for its commander. Neither did that army ever regard anything about that battle particularly disastrous, save the criminal neglect of those whose duty it was, properly to support our movement, which would have broken the back of the rebellion and given us Atlanta that autumn, and the results of our conflict to the rebel cause. Compared with the subsequent battle of Mission Ridge, it stands thus: crossing the river and the mountains,—carrying twenty-five days’ rations and ammunition for two great battles,—that army alone, in an unknown country, encountered Bragg’s entire army, reinforced by Longstreet’s corps:—at Mission Ridge and “ boarding at home,” as Mr. Lincoln quaintly expressed it, the Army of the Cumberland, reinforced by the 11th, 12th, 13th, 15th and 17th corps, under able and experienced commanders, fought the remainder of that same army of Bragg, diminished by Longstreet’s corps, which had gone to attack Burnside at Knoxville. Compared with the campaign of Atlanta, of which that of Chattanooga was the necessary prelude, it stands thus: in thirty-four days the Army of the Cumberland alone, crossed the Cumberland mountains, the Tennessee River, the Sand Mountains, the Lookout Mountains, fought Bragg’s army, reinforced by Longstreet’s corps, and gained its objective. In the Atlanta campaign, the same army of the Cumberland reinforced by the 11th, 12th, 15th, part of the 16th, [interlined in unknown hand: “the 17th”] and the 23d corps, pushed back that same rebel army, demoralized by defeat and weakened by the return of Longstreet’s corps to General Lee, and in sixty-four days gained Atlanta. All the “complaints,’’—for they never attained the dignity of “charges,”—made against me after I became the scape-goat of the sins of my superiors, such as, that the battle of Chicamauga was the result of a wild and imprudent desire to advance;—that I failed in prudence, courage, or energy, in the field of battle;—that General Thomas acted without orders, or was left to himself;—that I was subsequently about to abandon Chattanooga; —that I had not the confidence of my troops;—and hosts of personal “ regrets,” that I had become addicted to “intemperance,’’ “opium eating,” and “epileptic fits,” &c., are calumnies contradicted by facts, by my previous and subsequent record, and by the opinions of those with whom I have served or whom I have commanded; and many of them can be traced to the very doors of those whom honor and the sacred trust of office, bound to cherish a reputation, which is the property of the nation,—earned amid dangers in our cause, such as those my fellow-servants of the people never encountered. A friend to whom I have read the foregoing, says, it has been asserted in private and social discussions among those who do not know me, that, on the second day of the battle when I went to Chattanooga, it was from motives of “demoralization” or personal safety, and that I ought to say something on this point. I have already pronounced all such statements calumnious. What more could I say, that I have not already said, by actions in that and many other battles? Is it credible that I, who knew—very well knew—what was at stake,—I who knew that my country’s interests, her honor, the lives of my soldiers, and my own reputation, lay in the issue—did not understand better than my critics and calumniators, or any one at a distance, what was best to be done, or that I lacked the nerve or the will to do it? I refer strangers to my record and in face of it this day say,—despising the cheap glory of rushing around the battle-field, at best doing the work of subordinates, I directed my energies to a greater work. I did what a true general ought to have done, and only a good general would have done—against overwhelming odds and partial disaster, I reconstructed my line and provided effectually against the worst contingencies of the battle, and my country has reaped the benefits of this, my action. To enable my friends and impartial men, unskilled in war, to understand in some degree, the exigencies which took me to Chattanooga, I give a few words of explanation. For reasons stated in my official report of the battle, it had been determined at all hazards to hold the main road to Chattanooga, and all our forces were to be closed in that direction, where General Thomas had orders to stay with the promise of, “the whole army if necessary,” to support him. While supervising the closing of our troops towards this vital point, the enemy penetrated our lines through a gap made by the untimely removal of Wood’s Division from the line. This cut me off with two brigades of Davis’s, all of Sheridan’s division, and the cavalry, from the rest of the command,—then concentrated to the left of the gap. In vain, with these troops, we strove to resist;—the tide of overpowering numbers bore everything to the right and rear, and the enemy got on the “Dry Valley road,” which leads towards Chattanooga, and intersects the road through Rossville at the forks, five miles in the rear of the main position, which we still held. What was to be done? It was a critical moment. Should the enemy advance in force on this road, he would cut off or envelop and destroy Sheridan, Davis, all the cavalry and all our trains, containing our spare ammunition and rations, which lay over the ridge to the west of Dry Valley on Chattanooga creek, only three or four miles distant. The enemy was already on this road, a half mile in rear of our right—in rear of our cavalry—and on the flank of our trains: moreover, should our main position be forced, the enemy, by a simple advance on this road, would be in our rear, and convert a retreat into a disastrous rout,—in which all would be lost. To meet these actual and possible emergencies, it was necessary, at all hazards, to move back the trains behind Chattanooga creek, over which there was, unfortunately, but a single rickety bridge, for without these trains we could not live. It was necessary to cover this movement both against his cavalry in front of ours, and his infantry in rear, on the flank of the train. It was moreover necessary that our cavalry should so retire and move eastward as to keep between the enemy and our train, and also get between the enemy’s infantry and Chattanooga, and re-connect with our infantry so as to prevent the enemy from occupying the Rossville and Chattanooga road, where the Dry Valley road comes into it. There were, moreover,—the contingencies of the enemy’s cavalry movements to provide against, which might press ours in its movements, and still more, of those of Sheridan’s and Davis’s infantry, which might be driven into the valley of Chattanooga creek, and which in that event, must be brought promptly into the best position to cover the Rossville road and reunite with our main force. All this to be done—all these,—and many other contingencies then present to the mind of the Commander which it would be impossible to convey to the mind of the reader, and the necessity of providing for the changes which might occur while these movements were progressing,—required all the military coup d’oeil, coolness, promptitude and decision of the General commanding in person. And,—as it was manifest, from the noise of battle, that we still held our main position,—I sent General Garfield, my chief of staff,—in that direction to learn and report to me, while I undertook this work. I proceeded towards Chattanooga creek, rapidly examining the ground over which our cavalry must pass and fight if followed,—the roads and crossings of the creek,—dispatched the necessary orders for the movements of the cavalry and trains,—for the guidance and defensive parking of the latter,—for care of our spare artillery,—the collection of all our spare ammunition to be held ready for call,—and for the handling of Wagner’s and Spar’s brigades when required. Finding that Chattanooga was the only point whence I could promptly and surely communicate with and guide the cavalry and train movements, I had ordered,—and that it was in telegraphic connection with Rossville, whence I could communicate with the left more readily and promptly than at any intermediate point, when, as night came on and the country and roads being all strange, it would have been next to impossible for my headquarters to be found. Thus, from this point I was able to supervise the general movements of my command in a manner much more effectual than would have been possible from any other. It is impossible to convey to one who has not experienced it, an idea of a tithe of what passes through the mind and enters into the decisions of a General in a great battle. For example, in that battle, Gen. Garfield’s “ Field Order Book” alone contains fifty orders, written at my dictation; besides which, those of my aides-de-camp contain I know not how many more. It is the mind, not the body of the General, which, at such times, should rule and act. Prompt and certain communication between him and every part of his command is therefore the supreme necessity,—and where that can be best effected, there the General ought to be. This is more imperative when affairs become more critical and changes in the positions of troops more rapid. Yet it is more difficult under these circumstances to keep up this necessary communication, especially in a wooded country, like that in which we were operating, and at night, when it is almost impossible. In view of all this, and much that I cannot mention, it would have been worse than folly—it would have been a crime—to have selected my headquarters with any other than a view to provide for this prime necessity. I neither committed that folly nor was guilty of the crime. I secured full and prompt communication with all parts of my command,—supervised the movements of my troops,—secured my trains,—reconstructed my line in front of Rossville, and offered the enemy battle there the next morning, which he declined, and when everything was ready and our lines chosen, on the evening of that day took and held firm possession of Chattanooga. For this act of true generalship, am I to be criticised by those who have no experience—by calumniators, who never smelt the smoke of hostile gunpowder? Suppose my conduct on that occasion had not been what it was,—worthy of a true commander; suppose I had been weaker than I was; should loyal men and loyal papers forget everything else —ignore all former services? Should my fellow-servant of the War Department, who never exposed his life to the fire of an enemy for his country’s sake,—he who has made so many mistakes and abused so many men and officers—tried, true, and loyal as himself,—he, whom the country has forgiven this great debt on the ground of his “good intentions;”—should such a man have taken me officially by the throat and demanded the “last farthing”? Should he show no mercy to his fellow-servant, when so much has been shown by the nation towards him? But I have asked no mercy from the War Department, and none from my countrymen, in their judgments on my military services. All I ask from them is justice, rigorous, but impartial justice, and all the leniency consistent with it, towards those who have wronged me. I have refrained from appealing to the country for just judgment against these calumnies,—not because I shrink from contest with official power,—from the unprovoked injustice of which I now suffer,—but because, when the wrongs were perpetrated, I did not wish to divert public attention to personal matters, and thus weaken counsel, or the vigor of our blows against the Rebellion. Now, when the necessity for such silence has passed, and all the official injustice that could well be, has been done, I am solicitous that falsehoods shall not go into history. You will find on the foregoing points additional information, in my testimony before the “Committee on the Conduct of the War,” in May, 1865. I know every one of them to be indubitably true and susceptible of rational demonstration, and this I trust will be sufficient apology for the length of this communication. Transcribed from original held at Trinity College in Hartford, Connecticut, by William B. Kurtz on January 30, 2018.